We have just one game again this week. So I will do a requested one as well. The game for this week is Final Blow. Final Blow was released in 1988 by Taito. 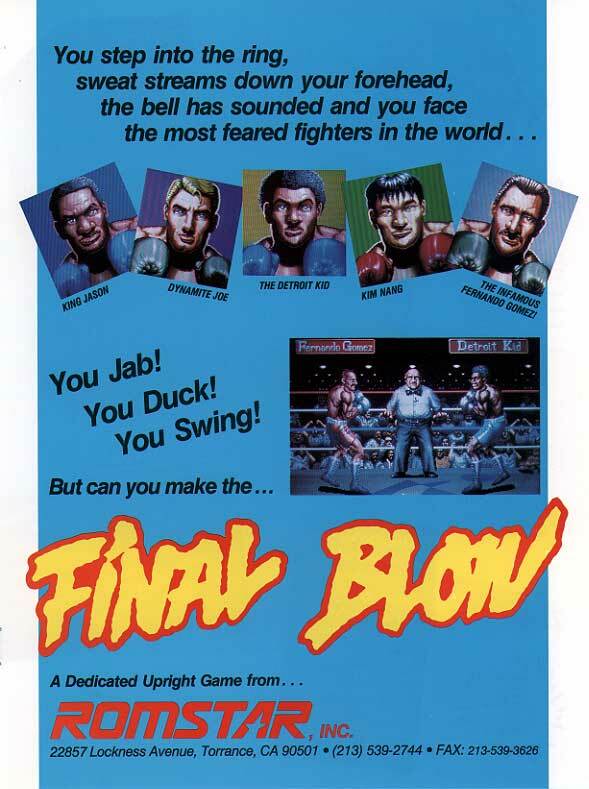 Final Blow is a 2D boxing arcade game in which you play as one of five boxers. Fighting you way through four bouts to become the world boxing champion. Each bout has a max time of three minutes and to win you need to KO your opponent, down your opponent three times or have a higher score from the judges at the end of the time limit. Age 27, Height 5' 12", Weight 195 1/2, Reach 69"
KO record time 0' 42"
Age 25, Height 5' 09", Weight 190, Reach 70"
KO record time 1' 05"
Age 33, Height 5' 14", Weight 193, Reach 74"
KO record time 0' 53"
Age 23, Height 5' 08", Weight 190, Reach 67"
KO record time 1' 32"
Age 28, Height 5' 11", Weight 200 1/2, Reach 71"
KO record time 1' 19"